Today my buddy Will and I headed out from Jacksonville to St. Marys, Georgia where we caught a ferry to the Cumberland Island National Seashore. We were meeting some other co-workers that headed over yesterday and when we got to the Ranger station we met up with the final member of our group. The ferry left St. Mary’s right on time at 9:00 and arrived on schedule at Sea Camp Ranger Station at 9:45. Unfortunately I made a crucial error and left the camera battery on the charger at home. Thanks to that mistake the pictures in this update will be slim. After sitting through about a 15-minute Ranger introduction to the Island and getting our backcountry permits it was time to hit the trail. None of us were in a big hurry so we took our time and enjoyed the scenery. 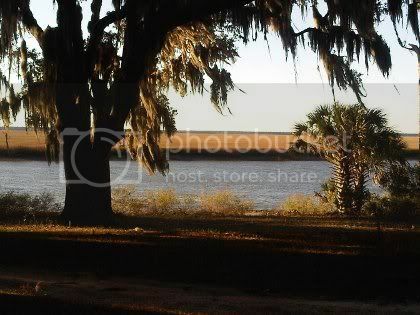 The landscape is very appealing and ranges from moderate palmetto stands to lush oak hammocks with a few pine trees thrown in for good measure. The old oaks really added a lot of character to the hike and were gorgeous to admire. We had hiked about 2 hours along the 8.5 mile Parallel Trail towards Yankee Paradise when we decided to take a quick lunch break. Our South African friend Bruce and I had been snacking along the way but we didn’t mind resting while Will enjoyed his lunch in a box. Heck, he even had an after-meal mint! We took a slight detour (ok, we missed the tiny marker for the Parallel Trail) via Pratts Trail and went through the Stafford campsite. It’s the greyline of the island I suppose. The only points of the island with treated water are Sea Camp and Plum Orchard. Stafford has running water with bathrooms and cold showers but drinking water has to be boiled or treated. From Stafford we headed down a short private road and picked up the PT again which took us through Hickory Hill and across the Willow Pond Trail. Willow Pond will take you down to the beach but we continued north where we intersected the Duck House Trail and the Yankee Paradise campsite. We saw a good bit of wildlife along the way including a lot of birds, numerous armadillos, and even some of Cumberland’s famed horses. Yankee Paradise is a very nice site with two large camping areas. The three of us picked our spots (I took the best trees I could find) and made camp. We were a little surprised that Eric and Andy hadn’t made it from Brickhill Bluff yet but figured they were taking their time and sightseeing. Since we knew we’d lose daylight about 5:30 we decided not to wait for them any longer and began the 1-mile hike to Plum Orchard. As it turns out the guys ended up meeting up with us shortly after we arrived. The NPS only does tours of Plum Orchard twice a month. We actually lucked out, though, and ran into Jeanie. She’s a NPS volunteer that’s started living in a renovated apartment inside the mansion for the next 6 weeks. She’d only been there since Sunday so giving as a private guided tour was a good practice for her to go over her notes. It really was a great experience. Plum Orchard was built in 1898 by Thomas Carnegie and his wife Lucy as a gift for their son George. The mansion is in great shape considering its age and includes 24,000 square feet and over 100 rooms. Walking in the front door the visitor is greeted by a beautiful sunken fireplace with seats on either side to enjoy its radiant warmth. 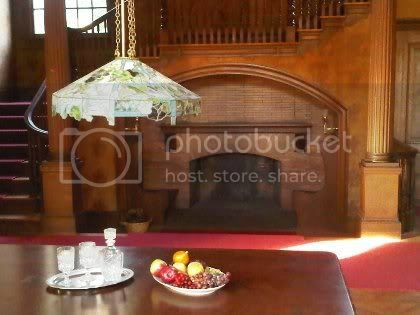 To the right is a large dining room. 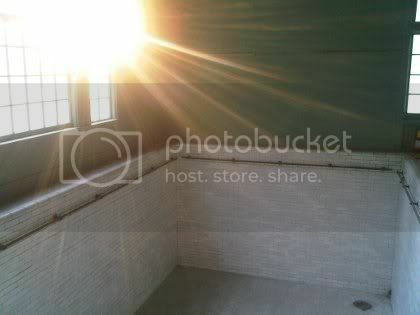 The mansion sports a cavernous marble pool. It’s fed by an artesian well and remarkably for its day was actually heated. Its appearance is deceiving when empty and looks much deeper than its 9.5′. 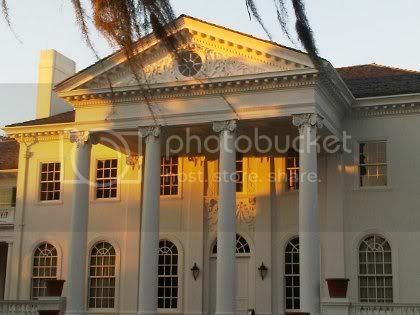 The property that the mansion sits on is absolutely gorgeous. It’s easy to imagine the family sitting under the massive oaks that surround the residence while enjoying a superb view of the river. With a wonderful private tour out of the way and our water supplies refilled we started the hike back to the campsite and arrived just as we were about to lose daylight. 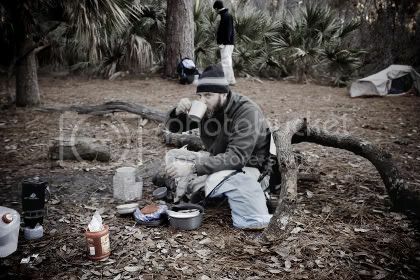 We got started on dinner and settled in around what would have been our campfire had it been allowed. We sat in the dark for a couple of hours talking about gear, other adventures we’d taken, and even (gasp!) some of the guys had the gall to discuss work. We awoke to temps in the low 40s but overall everyone had a good night’s rest. I think several of us were grateful to the makers of ibuprofen. We got to work quickly and each set about making our own breakfasts. Since I don’t normally want to carry all of the weight associated with real cooking on the trail I decided I’d use this weekend just for that. My starting pack weight was 37 lbs which is more than I’ve every carried but I had pots and pans along with other assorted goods. 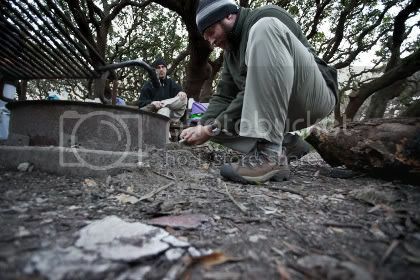 I also carried 4 stoves since I had several I’d never actually used in the field before. For this morning I’d packed Backpacker Pantry’s scrambled eggs and vegetarian bacon (whatever that is) to mix with my fresh mix of shredded cheddar, diced ham, and salsa. I even carried a freezer pack to keep everything cold! Unfortunately I hadn’t practiced cooking this on the camp stove before and it cooked a little faster than anticipated. It was still good but could’ve been better. Then again, what can you expect from freeze-dried eggs? Here’s the obligatory hammock shot of my humble abode. 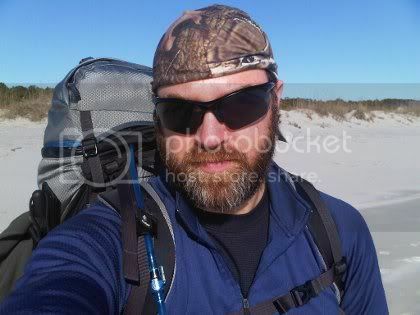 After breaking camp we decided on a change of scenery and took Duck House Trail to the beach. It was a nice stretch and even had a little elevation change through soft sugar sand before leading us back into the final oak hammock before dumping us out at the Atlantic Ocean. The seas were calm and littered with gulls and large pelicans out for a bite. There was also a massive gathering of terns. I was surprised at how many sand dollars there were along the beach. Had I thought I could get them back home in one piece I would’ve picked them all up. In hindsight I wish I had there were so many. I also couldn’t believe how many and how large the horseshoe crab shells were. We didn’t see any alive but the beach was covered in shells at least 1′ across. I’d never seen any that large. It was a nice walk with a cool breeze. It felt good to get lost in the rolling waves while scanning the beach for nice shells and shark’s teeth. We hiked several miles down the beach turning inland just before the Stafford Beach walkway. We got back on the PT and stopped at Stafford for a quick break. We arrived at Sea Camp Beach and found Eric who’d gone on ahead of us. We scored another awesome campsite (#13) with its own beautiful oak and a path up to the dunes (no direct beach access though). 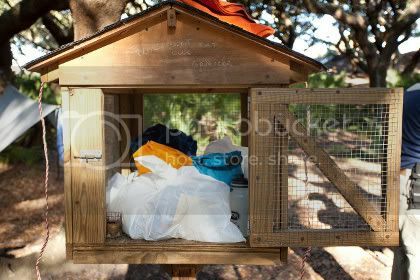 The sites at Sea Camp are more family-friendly and have picnic tables, fire rings, pack poles, and even a food box to (hopefully) keep your edibles safe from the prowling critters. After making camp and enjoying lunch the guys headed south to the Dungeness ruins. I decided to hang back and stayed at the site. It really was a nice, peaceful time where I was able to catch up on a book I’ve been reading. While I was sitting there a young doe even wandered into the site for a few brief moments. When the guys arrived I started a great fire and it worked wonders for driving the chill away. It was like a mini inferno. I’d found a large dead limb that we laid across the pit to keep it going. 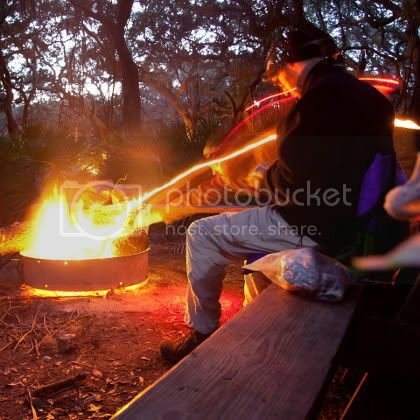 There really is little else that can make you feel the way a warm campfire can. Unfortunately the cell phone died early in the day so I don’t have any pics to share after the beach. I hope to be able to share some of Eric’s soon. It had been a long day so we let the fire die down and turned in about 9:30. This morning we awoke to a much colder day. The temp inside my hammock was 45 and the outside temp was 38. I really do need to buy a Kestrel so I can get accurate temps throughout the night and entire trip. I don’t need to know, but I sure do want to. I quickly piled on additional layers adding back the thermals I’d replaced the night before and throwing on an additional shirt. I ended up with 3 shirts and a pullover and 2 pairs of thermals under my hiking pants. The insulated gloves I purchased prior to the trip certainly came in handy but they made it difficult to break camp later on. While I was laying in my hammock not really wanting to get up and face the cold I had a horrible realization. 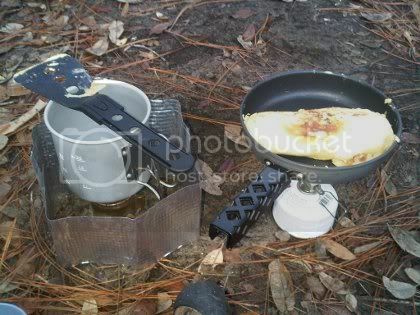 Remember I said I was trying out real camp cooking? Well, I’d planned on and had mentioned several times how I was looking forward to fixing pancakes this morning. Unfortunately I realized that I’d left the syrup behind. I still don’t know how. It was sitting right next to the things I’d grabbed for my omelet the day before and I’d just prepped it the night before the trip. The worst part is that I’d decided to pre-mix the batter at the house so it would be well mixed and not clumpy with sub-standard camp fixing. The total weight was about 19 oz and I ended up not fixing them. Talk about a disappointment of epic proportions. Since I’d decided to skip breakfast other than a cup of coffee I broke camp early so I’d be ready when the others finished. 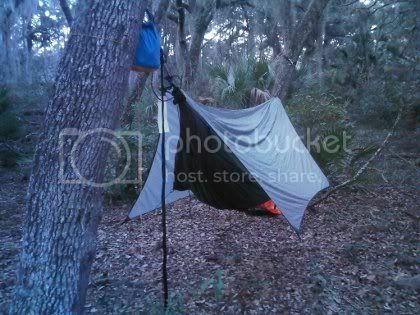 They can tear their tent setups down a lot faster than I can my hammock but for me it’s a heck of a lot more comfortable. We left the site at 9:45 and got to the dock about 10 which was perfect for a 10:15 departure. The ferry was packed with some that had come over with Will and I along with a few others including a large group of Scouts. We actually passed them on our way to Sea Camp on Saturday and were surprised they only stayed the night especially with all of the stuff they brought with them. I hadn’t kept my sunglasses out so I just sat on the side of the ferry with my beanie pulled over my eyes and “napped” on the 45 minute ride back. 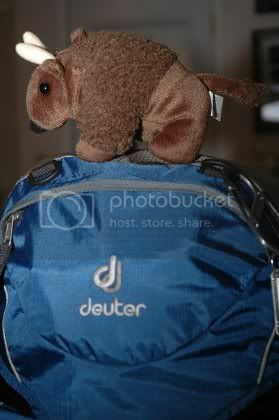 One of the things I like and try to do on every hike is bring something back for my son. I know that he’d really like to be out hiking with me but until he’s older and can do some distance (I know he’ll give out quickly at this age) I do what I can to bring a little bit of the hike home. 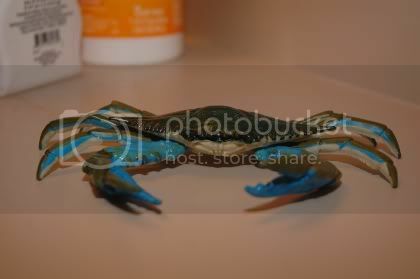 I headed to the gift shop and picked up a toy blue crab. He loves hard animals that he can play with in the tub and I thought it’d be a perfect addition to his growing collection. 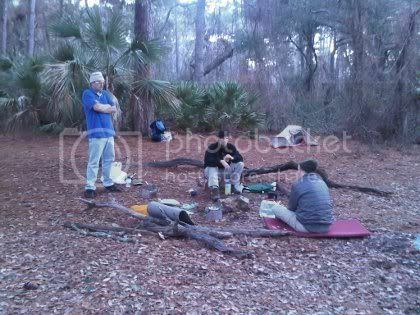 I am going to try and do a similar trip at the Cumberland Island National Seashore sometime in the near future. Unfortunately I live about 6-7 hrs away, in Alabama, so my planning may be a bit different. I have never done a beach/sand-type trip (the closest being Conecuh National Forest last Summer), so I think this one would be a great one to start out on. From your words and pictures it seems like you guys had a great time. Do you have any advice on this particular trip or other beachside/near the coast trips that you know of? We definitely had a great time. The guy that put it together goes every year. The best advice I can give you is to call the ranger station before you finalize your plans. For example, I believe Yankee Paradise was closed this year. I don’t recall the reason but fire is on my mind. Not sure if that’s accurate or not. Beyond that I’d just allot enough time to take in all of the sites. With hiking and exploring time maybe a day per site. The standard route for this group is to start at Brickhill Bluff to explore the northern end of the island. Next stop is Yankee Paradise and exploring Plum Orchard. From there I’d take a day at either Hickory Hill or Stafford Beach and take the time to enjoy the beach and maybe do some shell hunting. I’d wrap it up with a night at Sea Camp to make the way for an easy exit on your last day. There are only a couple of tips I can think of. Brickhill is very windy so be prepared. If you hammock then you’ll want long straps for Sea Camp. The trees are pretty large in diameter. Only Stafford Beach and Plum Orchard have potable water so you might want some containers for extra water. Hey..we are planning a trip such as yours. You mentioned in your email that you start at Brickhill Bluff, did you take a ferry to that point? If not what route? Secondly, we plan to hammock, so are there plenty of trees for that? Mary, the ferry drops you on the opposite end of the island. You have to visit the Ranger’s Station first to check-in even if you’re using one of the backcountry sites. From there it’s a pleasant hike to Brickhill. As for the route I’d take a look at the map at the CUIS website (http://www.nps.gov/cuis/index.htm). There are too many short trails for me to remember them all. I’d start out with the Parallel Trail and take it as far north as possible. From there you can do a combo of road/trail walks. I didn’t have any problems finding trees. The only warning I have for you is if you stay at Sea Camp. We did that the last night so it’d be easier for us on the last morning to catch the ferry back. The trees there were rather large and I’d recommend at least 12′ straps as I mentioned in my reply to Jared. Other than that you shouldn’t have any problem. Let me know how it goes! I’m going to miss it again next month. It’s too close to the 3rd Annual Florida Hang and our vacation schedule has changed.